The bar at Hitachino Beer & Wagyu. All photos: © tablehopper.com. Some of the booths in the back dining area. An array of sake cups/jars used for bar snacks. The view from the back of the space toward the front. 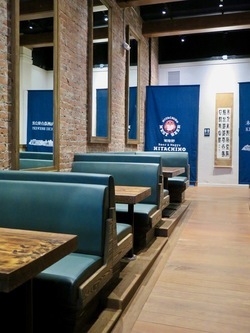 Back in the summer of 2015, tablehopper was first to report on the opening of a Hitachino-affiliated project in San Francisco, and I’m so happy to see ~HITACHINO BEER &AMP; WAGYU~ is almost ready to open its doors, the first Hitachino-operated location in North America. The Kiuchi family has been brewing sake since 1823 and is now in its eighth generation. All the craft beers will be served fresh on draft from kegs. 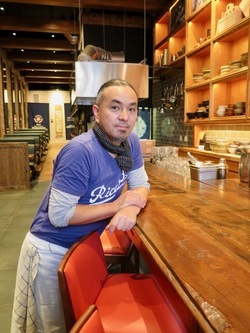 We have been checking in with chef Noriyuki Sugie over the past couple of years, so let me tell you more about him. Some past highlights oh his international career include a chef de partie position at Charlie Trotter’s in Chicago, working at Tetsuya’s in Sydney, as well as opening his own Restaurant VII. He was also chef de cuisine of Asiate in the Mandarin Oriental Hotel in New York City. Sugie has been collaborating with Kiuchi Brewery/Hitachino Nest Beer for the past 10 years, from creating a menu for the Hitachino Brewing Lab (a bar and homebrewing classroom) in Tokyo to consulting on the opening of Hitachino Hong Kong. As for what he has in store for the TenderNob’s Hitachino Beer & Wagyu, it’s going to be a two-stage process. Opening first will be the bar menu, featuring 10 specialty Hitachino drafts—3 of which are exclusive to and brewed for San Francisco. 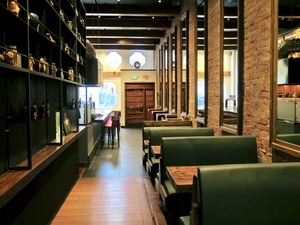 Take a look at the opening menu here, which includes specialty barrel-aged beer as well. You’ll be able to get a 10-oz. pour, or try a tasting flight of three. No bottled beers will be served. An interesting and future program will invite SF brewers to the brewery in Japan to create special beers. There are also six kinds of Hitachino Kikusakari sakes, as well as Kiuchi umeshu plum wine, yuzu wine, and red wine—and charcoal-filtered water, of course. To accompany the pours is a menu of bar snacks (both warm and cool) served in glass sake cups/jars and then poured into a bowl for diners to enjoy. Dishes include octopus sunomono; spicy squid and chorizo; meatballs with shiso, ponzu, and oroshi (grated daikon); pork belly kakuni with pickled egg; chicken gizzard with shishito pepper, garlic, soy, and shichimi; and beef suji nikomi with oxtail, miso, daikon, and konnyaku (a funky gelatinous substance made from a type of potato). Most dishes are $8. The next phase of the project will be launching the Kappo menu, centered on fine-bred Hitachiwagyu beef from Sugie’s home region of Hitachi. It will be cut and grilled at the kitchen’s teppan grill. 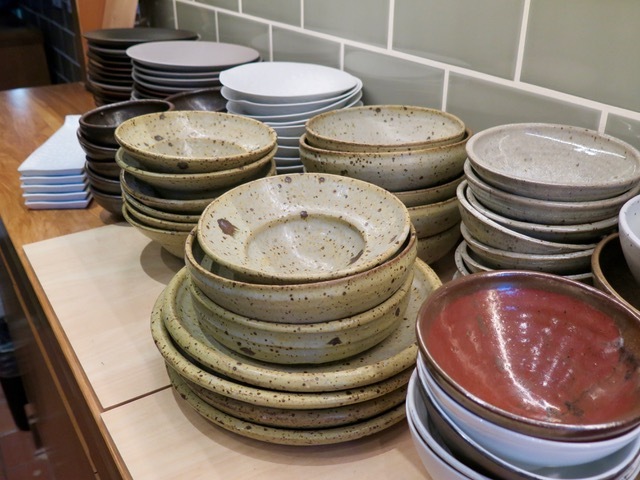 The inspiration is Kappo style, which is from Osaka, and means “to cut.” While designed to serve with beer and sake, it’s a nicer presentation than izakaya style, served on ceramics and other lightly refined touches. It will be a prix-fixe experience and will include a variety of dishes, including seafood and vegetables. 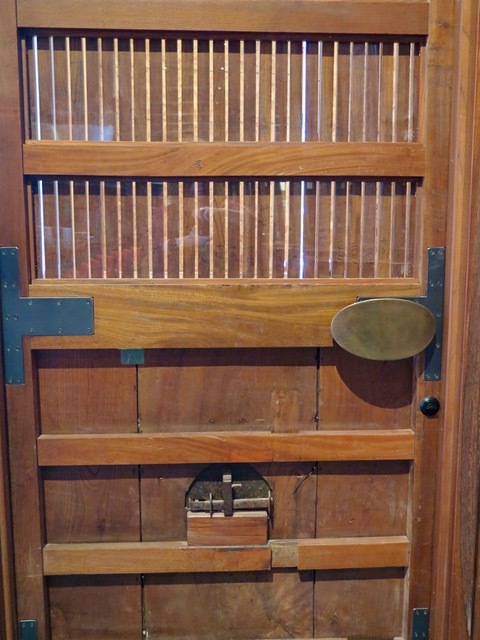 The cool Art Deco building (previously Kyu Sushi) now has a beautiful door from Japan, more than 100 years old, previously used for a storage area (note the vents on it). 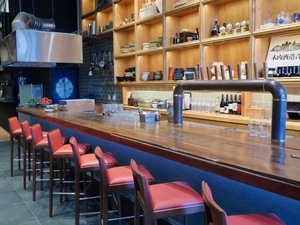 Once you walk in, you’re greeted with a long bar made from heavy wood that was used to press rice while making sake, with barstools with bright poppy seats. There are cherry blossom wood cabinets, stocked with pottery from Japan as well as some made in conjunction with a potter in Grass Valley. 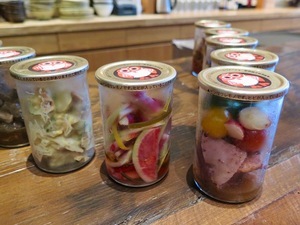 Throughout the space, there are some displays of ingredients like preserved lemon and pickles, plus spices that highlight the notes in the beers. In the back of the restaurant are a variety of booths (most for 4) in a gray-blue with one large booth in the back for 5 or 6 guests, and a few tables as well; there are just 26 seats total in the whole space. You’ll note some vintage touches, like the exposed brick walls and Deco window cutouts. As for the BIG QUESTION: when does it open? Right now they are waiting for the brewmaster to come from Japan, which is any day now. Once they get the okay, they will be opening for bar snacks and pours, and then launching the wagyu menu soon thereafter—be sure to sign up on the mailing list on the site to keep up on the news and prioritize your spot on the reservations-only list. As soon as I hear any concrete dates, I’ll let you know! 639 Post St. at Taylor.